Below you will find the Constitution and the By-laws of the Ballroom Association UW-Madison. These documents have been voted on and passed by the student membership. If you would like to download copies, there are links at the bottom of the page. Looking for the description of a Council position? Scroll to the By-laws, about two-thirds of the way down! A. Name: The name of the organization is the “Ballroom Association of UW - Madison” (herein called the “Association” or “BAM”). B. Seat: The seat of BAM shall be the address of the incumbent president unless otherwise directed by the Executive Council. C. Structure: BAM is an open membership organization managed by an Executive Council (herein called the "EC" or "Council") consisting of elected delegates, as specified under this constitution. 1. Organizing and fostering social ballroom events locally. 2. Organizing and fostering programs which assist in the expansion of amateur ballroom dancing and assist in the elevation of dancing skills among amateurs. 3. Organizing and fostering events at which the consumption of alcoholic beverages is not promoted. A set of bylaws shall be kept to provide detailed information on general policies established by this constitution. At a minimum, the bylaws must address the positions and duties of all members of the Executive Council, a sexual harassment policy, and the process for adjudicating complaints of misconduct. The bylaws may be amended or repealed by one of the two following procedures. 1. The Association’s voting members must be notified of the proposed changes in the bylaws a minimum of two weeks prior to the General Election Meeting (GEM). 2. Voting members shall cast votes regarding the proposed changes in person during the GEM. Whether voting on proposed changes in the bylaws will take place prior to or following the election of officers is at the discretion of the EC. 3. Proxy voting and advanced registration of votes by other means shall not be permitted. 4. If fifty-one percent (51%) of the voting members present at the GEM cast an assenting vote, the changes will pass and shall take effect the day following the GEM unless a different date has been specified by the EC before the voting occurs. 1. A two-week voting period shall be set by the EC. This period may not begin any earlier than two weeks after the voting membership is notified of the proposed changes in the bylaws. 2. The voting members shall be notified of the proposed changes and of the voting dates. 3. Voting members of the Association shall register their votes by signing a voting record. 4. If fifty-one percent (51%) or more of those members voting cast an assenting vote, the changes will pass and shall take effect the day following the close of voting unless a different date is specified by the EC prior to the beginning of the voting period. Changes to the bylaws may be proposed to the Association’s membership either by a two-thirds (2/3) majority vote of the EC or by a petition submitted to the EC by ten percent (10%) of the general members. In the event of such a petition the changes must be presented, with or without recommendations by the EC, to the voting members no later than two weeks after the petition is received by the EC, and the voting period shall commence no later than 30 days after the petition is received by the EC. A. Eligibility: Membership, officer positions, and participation in the Association shall at all times be open without discrimination on the basis of race, color, creed, religion, national origin, disability, ancestry, age, gender, sexual orientation, pregnancy, marital status, parental status, or veteran status. B. Membership dues: Any eligible person will become a member of BAM upon payment of dues for the current semester or year. The Executive Council shall have the right to confer honorary or special membership. Free memberships are granted to serving members of the EC. C. Membership privileges: Any member who is a student of the University of Wisconsin-Madison shall have the right to vote in any general or special election. All members (student or otherwise) shall be entitled to any other membership privileges determined by the Executive Council. D. Conduct: Members shall abide by the rules and standards of BAM and shall conduct themselves in a constructive, courteous and orderly manner. Members also have an obligation to keep BAM informed of their current address for purposes of correspondence and notification. E. Establishment of a Sexual Harassment Policy: Due to the physical nature of ballroom dancing and the fundamental structure of BAM as a social club, dealing directly and quickly with issues of sexual harassment must be considered vital to the survival of BAM. 1. BAM must always have an established policy concerning sexual harassment, which will include, at a minimum: guidelines on what constitutes sexual harassment, how the EC will receive and investigate complaints, and how the EC will deal with offenders. This policy will be written into the Association’s bylaws. 2. The EC will do everything in its power to ensure that every BAM member receives a written copy of this policy and recommendations on how to prevent sexual harassment. 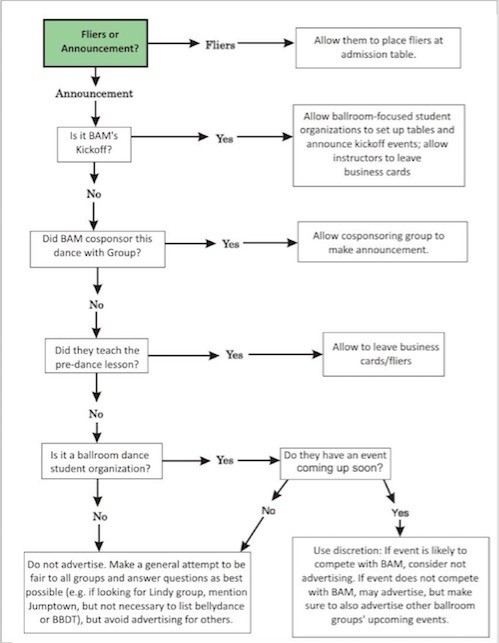 It is strongly recommended that a version of this information be posted and/or made available at every BAM dance. F. Misconduct: Anyone can, at any time, submit a formal complaint to any member of the EC concerning any BAM member(s), or occurrence(s) at any BAM function. The procedure to be conducted in response to the formal complaint: will be detailed in the Association’s bylaws. 1. Investigate, evaluate, and propose to the voting membership such changes in organizational structure, rules, etc. as shall be advisable. 2. Provide a forum to identify problems, issues, and potential solutions and shall assist in developing options and alternatives for actions of the Association members. 3. Interpret and enforce the existing enabling documents, bylaws, and rules of BAM. 4. Create and appoint committees for purposes and durations as needed, and assign committee chairpersons. 6. Plan club events and set event and meeting dates. 7. Decide all financial matters for the club. B. Members: There shall no fewer than seven (7) delegates of the Executive Council. The three standing positions shall be the President, Vice-President and Treasurer. The remaining positions shall be those deemed necessary by the EC and shall be described in the bylaws. The EC may create and appoint, at its discretion, additional positions on the Council. Such newly created positions will become permanent only by a change in the bylaws approved by the general membership. Only persons who have been duly elected to a Council position may vote in matters before the Executive Council. All other Council members shall be considered non-voting members. At any given time, no more than forty-nine percent (49%) of the EC may be non-voting members. A position may be shared by more than one delegate only when all positions have been filled. In such cases, the position will be considered as having only one delegate in the numbers required for quorum and action, and only one delegate may cast votes. If there are two delegates sharing a position, they are to decide between themselves how they will manage the casting of votes. The Council’s three (3) standing positions (President, Vice-President and Treasurer) may not be shared. C. Meetings: The EC shall meet periodically as needed when a meeting is called by the President or any three (3) voting delegates of the EC. Meetings of the EC shall be chaired by the President or, in the President’s absence, by the Vice-President. Every effort shall be made to notify all voting delegates in advance of this meeting. D. Quorum and Action: A majority of the voting delegates (51% or more) of the EC shall constitute a quorum. However, any action of the EC shall require an assenting vote by a majority (51% or more) of the voting members of the EC, regardless of how many of these members are present at the vote. E. Reporting: Any member of the Association shall have access to the minutes of any EC meeting. F. Selection and Term: Any member of the Association is eligible for nomination to office. Nonstudents may be considered for candidacy to the EC only for positions where there is no student presenting him or her self as a candidate. A non-student may not serve as President of the Association. Members of the EC shall be elected at the end of the Fall and Spring semesters. The exact date of the elections will be determined by the EC. Each elected officer will serve for the following semester plus the preceding break. Specifically, officers elected in the Fall will take office the day after the Fall semester ends and will serve until the last day of the Spring semester. Officers elected in the Spring will take office the day after the Spring semester ends and will serve until the last day of the Fall semester. In the event a newly elected officer is not available to serve during the break, the outgoing officer in that position may remain in power until a later date to be determined by the newly elected officer. In no event shall the outgoing officer remain in office past the first day of classes of the following semester. If during the Spring elections it is determined that neither the newly elected officer nor the outgoing officer are able to serve for the summer, an officer will be appointed to serve in that position for the summer. The exact dates of service will be determined by the newly elected EC. If an office is not filled at an election, the remainder of the EC may appoint someone to that position who will serve in a non-voting capacity. New EC members who have been duly elected will be expected to inactively observe all meetings and functions pertinent to their respective offices until they take office. G. Election Procedures: Elections shall be held at a General Election Meeting (GEM) consisting of not less than twenty percent (20%) of all voting (i.e. student) members. During the GEM, nominations and seconds may be accepted from any general member eligible to vote in the GEM. A nominee must receive a majority of the votes of the attending voting members to be elected to office. If no nominee receives a majority, the two nominees receiving the most votes will participate in a run-off election. All members eligible to vote in the GEM must be notified (if reasonably possible) of the GEM at least one (1) week prior to the date on which the GEM is to take place. H. Proxies: Proxies may not be used for any purpose, at any time, relating to the EC. 1. When it becomes know by the Council that a vacancy has been or will be created, an announcement period shall commence and will last for a minimum of two weeks or through the next two dances, which ever is longer. 2. During the announcement period members of the organization will be notified through announcements at dances, on the Association's web site, in e-mails, and in any other way deemed appropriate by the EC, that a vacancy on the EC needs to be filled. 3. A meeting date will be chosen by the EC for the selection of the replacement officer. This date may be a regularly scheduled meeting of the EC, or it may be a special meeting. The date chosen may not be before the end of the announcement period. 4. Persons interested in filling the position will be asked to contact Council and to attend the meeting during which a replacement will be selected. Non-students will be eligible for the position only if no student is presenting him or her self as a candidate for the position. 5. At the meeting during which the replacement officer is to be selected, the EC will hear personal statements regarding the reasons for applying and suitability of each of the interested candidates. 6. Anyone applying for the position who is unable to attend the meeting during which the selection is being made will be asked to provide the EC with a written statement prior to that meeting. 7. After hearing or reading each candidate's statement, the EC will discuss the candidates and whom might best fill the position. A vote will then be held to determine whom is to fill the vacancy. 9. If there are three or more candidates and none receives fifty-one percent (51%) or more of the votes during the initial voting, a run-off between the two candidates receiving the most votes will take place. 10. If there are only two candidates and neither receives fifty-one percent (51%) or more of the votes during the initial voting period one additional discussion session and voting period will be permitted, or the issue may be tabled for the next council meeting. 11. If after a run-off vote, or after a second discussion and vote period of a failed vote between only two candidates, there is still no candidate receiving fifty-one percent (51%) or more of the vote, the issue shall be tabled for reconsideration at the next council meeting. 12. It is permissible to convene a special meeting for the resolution of vacancy appointments. However, meetings shall be held no more frequently than once every seven days. J. Resignations: Any member of the EC may resign at any time. Resignations shall be submitted in writing to the EC and shall become effective without approval at the time specified therein; if no time is specified, then upon receipt. 1. A two-week period for holding the election shall be set. The Special Election shall begin at the earliest possible date, but no sooner than one week following notification of the voting membership. 2. The voting membership shall be notified that a Special Election is to take place and what the dates of the voting period are. 3. A minimum of one candidate shall be found for each Council position vacant at the time the Special Election is held. Any vacant position(s) may be filled only by persons eligible to be voting members or the Executive Council. 4. Voting members of the Association shall register their votes in person by signing a voting record. 5. Any candidate(s) approved by fifty-one percent (51%) or more of those members of the Association who vote in the Special Election shall become (a) duly elected voting member(s) of the Executive Council. L. Conflicts of Interest: Members of the EC may not represent any other dance-related organization in their relations with the Association regardless of that organization's affiliation or lack thereof with the University. M. Compensation: Members of the EC shall not be compensated in any manner for any work done on behalf of the Association during their tenure on the Council and for a period of one (1) year following vacation of service on the Council. The ONLY exception to this is the granting of free membership to members of the EC. A. Creation of Committees: The Executive Council may create committees for purposes and durations as are needed. Examples include dance programming, public relations, social outings and instruction committees. The chairs of these committees shall be designated by the EC. B. Committee Functions: It shall be the duty of each committee to competently perform the duties ascribed to each by their respective chairs. 1. Incur debt on behalf of BAM without the prior consent of a majority of the voting delegates of the EC. 2. Circumvent or alter the rule, policies, or procedures as established by this constitution, the bylaws or the EC. 3. Create rules, procedures, or policies for BAM unless so directed by the EC. 4. Exceed their prescribed duties or functions without the consent of a majority of the voting delegates of the EC. A. Fiscal Year: The financial year of BAM shall be September 1 through August 31. B. Dues: Members shall receive full rights and benefits of membership upon receipt of their dues. C. Books and Records: The books and records of BAM shall be open to inspection by any general member and by other such persons as may be approved by the EC. Copies of the BAM constitution and bylaws shall be available for viewing on the Association’s web site, and for purchase by any interested member for a cost which covers the BAM expenses for printing and mailing. D. Financial Authority: Any member of the EC whose position is described in the bylaws shall have the authority to approve non-budgeted club related expenditures of under fifty dollars ($50) no more than once between meetings of the EC. Should this privilege be abused the EC has the right to revoke it. Expenditures of fifty dollars ($50) or more require EC approval. Payments to instructors and facilities for official Association events are considered approved unless otherwise specified. The Executive Council may opt to obtain insurance or otherwise indemnify the voting members of the EC against liabilities, suits, or other actions taken against them for situations arising which are directly related to their service to BAM. There shall be, however, no indemnification of any person found guilty of committing unlawful acts and no indemnification which would be unlawful or contrary to public policy. This Constitution may be amended or repealed when BOTH of the following criteria are met: 1) Fiftyone percent (51%) of the voting membership give an assenting vote, and 2) The proposed changes receive an assenting vote by two-thirds (2/3) of the people who actually vote. 1. Changes are proposed to the membership. 2. A start date for voting is determined. This start date can be no earlier than 4 weeks after the first day of classes for the semester. 3. Only people who are voting members of BAM before this start date are eligible to vote on the changes. 4. Members may vote ONLY by signing a voting record. Amendments may be proposed by a two-thirds (2/3) majority of the voting members of the EC, or by a petition by ten percent (10%) of the general members. In the event of such a petition, the amendments shall be presented, with or without recommendations, by the EC to the general membership and the voting period must commence no later than thirty (30) days after the petition is received by the EC. In the event that the Association should be dissolved, the association shall apply any assets it may have toward the full payment of all debts. Any assets remaining after all debts are paid in full shall be donated to the University’s ballroom dance programs. Reminds officers of duties and delegates jobs. Represents Association at the official level. Registers Association as a student group. Acts as spokesperson to student and University government. Ensures compliance of the Association in following University of Wisconsin and governmental policies and regulations. Serves as chair of the Executive Council. Assists President in fulfillment of special duties. Follows up on deadlines set by President. Performs Presidential duties in President's absence. Is default chairman of special committees. Is responsible for the inventory of all the club's equipment. Serves as interim officer for any EC position vacated during a semester until a replacement is appointed by the EC. Maintains the membership Excel database and email distribution list. Keeps prepares and updates the Bylaws. Types minutes and makes file copies. Records and tallies election votes and decisions. Writes thank you notes and correspondence. Works with council to develop budget. Applies for any outside funding. Distributes club funds as ordered by EC. Designs and distributes posters and flyers. Designs and prints tickets for events. Solicits publicity of the Association's events and purpose. Maintains communication with University Ballroom Dance Programs. Represents public relations committee(s) to EC. Makes room reservations for dances, lessons, and practices. Works with other dances organizations to maximize the number of social dances on campus. Maintains the schedule, announcements, and all other information on the BAM website. Organizes sound system setup, take-down, and transport. Plays music at dances or delegates others to help. Finds new music for the music collection. Schedules instructors for all dances, workshops, and other lessons. Chooses dance genres to be taught at lessons. Is required to attend all instruction (unless he/she sends a delegate). Helps represent Association to University. Advises board about University policy. Sexual harassment is any uninvited and unwelcome verbal or physical behavior of a sexual nature. These situations are not limited to male-female relations and can take place between members of the same gender. BAM wishes to provide a welcoming dance environment where everyone feels safe from harassment in any form and the Council encourages members and guests at our events to bring any instances of harassment to the attention of the Council. The process for resolving instances of sexual harassment and misconduct is as listed below. The EC shall discuss the complaint, attempting to keep the complainant and alleged violator(s) anonymous. The EC shall determine whether further formal action is warranted based solely on the merits of the complaint. If further formal action is recommended, the complainant must agree that their name may be revealed to the alleged violator during the formal complaint proceedings at the discretion of the EC but no later than step 5 below. The EC shall notify the alleged violator(s) of the complaint, and the procedure for adjudication of the complaint. The alleged violator(s) shall have three (3) days following notification in which to respond. The EC shall meet to review the facts relevant to the complaint and determine if an investigatory committee is necessary. The EC or an appointed investigatory committee shall have ten (10) days following this meeting of the EC in which to prepare a report. The report, which shall be submitted to the alleged violator(s), complainant and the EC, shall include all facts relevant to the complaint (including the name of the complainant) and recommendations for how the EC should handle the complaint. The alleged violator(s) shall have five (5) days after submission of the report within which to respond to the EC if the alleged violator(s) wish to contest either the findings or recommendations. Failure by the alleged violator(s) to respond to the report shall be considered acceptance by the alleged violator(s) of the findings and recommendations. The EC shall, within ten (10) days following submission of the report, conduct a vote to determine whether disciplinary action is warranted and what the action will be. Disciplinary action may include, but is not limited to, loss of membership and exclusion from BAM events. Should the alleged violator(s) contest the report, the complainant and the alleged violator(s) shall be invited to appear at the next scheduled meeting of the EC where the matter shall be adjudicated. The EC will then vote to take whatever actions it deems appropriate to respond fairly to the complaint (possibly including further investigation). During the period of investigation, the alleged violator(s) shall, unless otherwise specified by the EC as a result of prima facie evidence of a violation, maintain his/her membership. In the event of loss of membership, the individual is not eligible to reapply for membership for one year following the loss of membership. After one year, the approval of the EC is necessary to reinstate eligibility. If deemed appropriate by the EC, names of the alleged violator(s) and complainant(s) may be omitted from the minutes. If deemed appropriate by the EC, discussion of the formal complaint may be conducted in closed meetings, open only to the EC and individuals requested by the EC. With respect to advertising for and announcements by other ballroom organizations and persons at BAM events. It will be the policy of BAM to follow the flowchart shown below. (Figure 1) The EC may, by majority vote, choose to advertise in situations that would otherwise not be allowed.